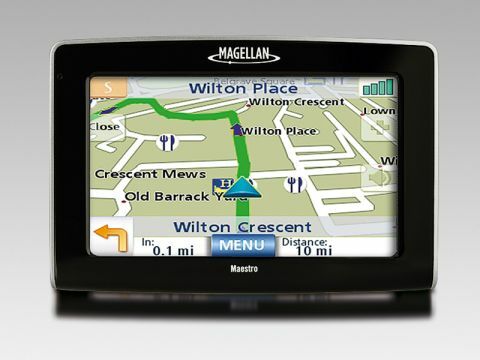 Magellan's Maestro 4245 (£300 inc. VAT) is a feature-packed sat nav device, offering maps for 17 European countries. It has a sleek design, and its 17mm depth helps it to slip in pockets or handbags with ease. All the functions are controlled onscreen, using the crisp 4.3-inch touchscreen. We found the display bright and easy to see in all conditions, and there's enough space for large buttons, making it easy to use even for those with large fingers. Destinations can be selected by full postcodes or address, or by simply picking from a map. Numbers and letters are found on separate pages, but it's quicker than some rival devices thanks to the unit highlighting possible characters for you to select next. You can also search thousands of Points of Interest (POI), such as the nearest garage or bank. The 4245 uses a SiRF Star III GPS chip, which currently offers the most accurate tracking. It started up quickly, and we had no trouble with signal strength. The maps are provided by Navteq, and we found them attractive and easy to follow. Verbal instructions also proved clear. The cradle is robust and easy to adjust, and held the Magellan firmly in place. We found it easy to attach to a windscreen, although it's too big to fit in a pocket. Features include a Traffic Message Channel (TMC) receiver - helping you to avoid congestion. You'll also find Bluetooth in place, so you'll be able to connect a mobile phone and use the 4245 as a hands-free kit. It lets you send and receive text messages once paired with your mobile, but we had trouble getting this function to work, despite pairing with several different models from a host of phone manufacturers. The Maestro 4245 is an attractive and useful tool, but we're not completely convinced the features make it better than cheaper rivals. Most notable is the lack of Bluetooth compatibility with some phones - so you should definitely try before buying.